Greetings! I hope the new year is starting out well for you. This month I am happy to feature an artist that I have just added, Wesley Neal Rasko. Also, I’m excited to share with you my new inventory of maestro Lino Tagliapietra. At a time in life when most artists would be relaxing and resting on their laurels, Lino is creating some of the most beautiful and sophisticated work of his long and distinguished career. As always, your questions and comments are very welcome. Enjoy the artwork! 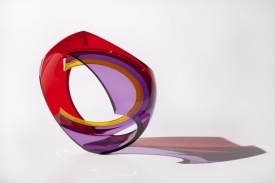 "I would like to make glass that is timeless, that stays forever young." Of the dozen or so new Lino works that I have just added to my website, I have chosen two of my favorites to offer you. Please visit my website to see them all. What an exuberant piece! 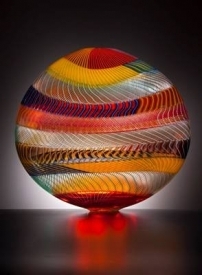 The layers of color, the alternating angles of cane work complemented by the alternating diagonal slants of the surface cutting… actually all of the elements in this piece combine to form a vibrant and joyful whole. 17" x 6.75" x 8"
14.25" x 18.25" x 18"
Canadian born Wesley Neal Rasko has worked both in North America and Eastern Europe, particularly Prague. 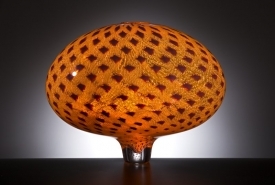 His apprenticeship with Bohumil Elias from 1999-2000 has been a great influence in his subsequent glass art. His forms are architectural in character and have a simple, straight forward beauty that is also dramatic in its own quiet way. He has exhibited extensively in Canada, the U.S., Czech Republic, England and the Netherlands. Attitude, 22.9" x 7.9" x 7.9"
Vatnajökull, 28" x 18.8" x 3.5"
Like all of Harry Pollitt’s cast glass sculptures "Splash" is abstract, fluid and organic. The use of negative space in this particular sculpture is quite important. The deep teal color is very appealing and the overall effect is one of a strong, quiet presence. As in all of John Kiley’s pieces, "Semi Halo" is elegant and understated. 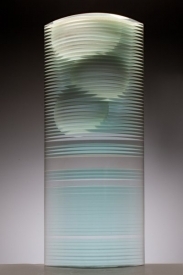 I love both the graceful form of this piece and its beautiful colors. Once again John has created a piece that makes the viewer want to see it in person and enjoy it from many angles. It has been quite some time since I have been able to offer a smaller cube by Jon Kuhn. 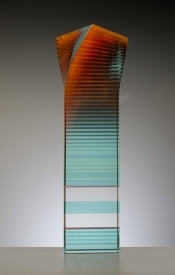 This one has an amazing color core and, like other pieces in this series, must be seen in person and turned slowly on its base to fully enjoy all of the optical intricacies of the sculpture.